Synopsis: Please Read Notes: Brand New, International Softcover Edition, Printed in black and white pages, minor self wear on the cover or pages, Sale restriction may be printed on the book, but Book name, contents, and author are exactly same as Hardcover Edition. Fast delivery through DHL/FedEx express. 1. 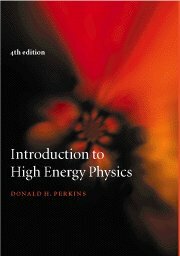 Introduction To High Energy Physics,4Th Edition: Perkins Donald H.